Say what? 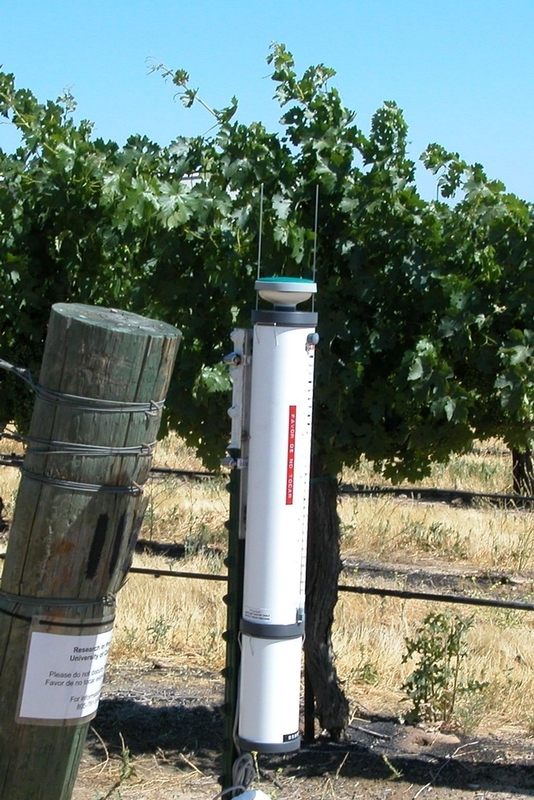 Atmosphere meters can be used to assess irrigation requirement. Here's a great little report from Mark Battany, our advisor in Santa Barbara and San Luis Obispo Counties. 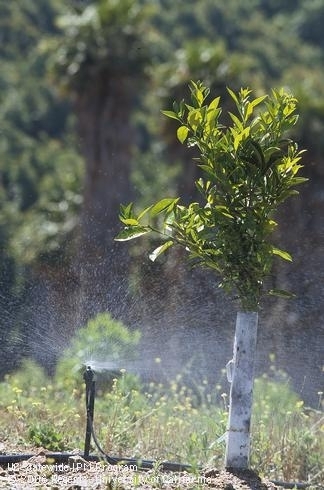 Efficient and precise irrigation management is becoming increasingly important inCaliforniaagriculture, both for maximizing crop quality and for conserving water. The most advanced irrigation scheduling strategy is based on local measurements of reference evapotranspiration (ETo), which is converted to crop evapotranspiration (ETc) with an appropriate crop coefficient (kc). To be able to use this method, an irrigation manager needs to have locally accurate ETo values throughout the growing season. However, the highly variable microclimates that characterize many farming areas often make it difficult to use data from distant weather stations; therefore an accurate local measurement may often be preferable to relying on a regional value. One inexpensive option for measuring ETo locally is to use a simple atmometer. Atmometers are water-filled devices, in which the actual evaporation of water is measured over time. In their simplest form, the atmometer is outfitted with a graduated sight glass on the water supply tank which allows the user to easily measure the evaporation that occurred over a given period. In practice, this type of atmometer is most suited for making readings at multiple day intervals, for example once per week, or on days when irrigation is applied. 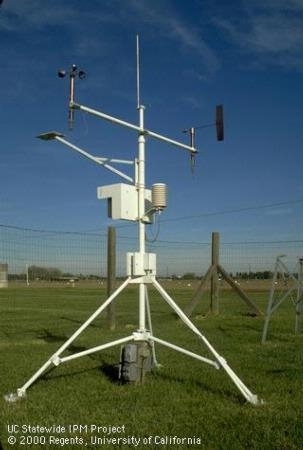 The performance of atmometers versus more expensive weather stations was evaluated on the CentralCoastin 2003. 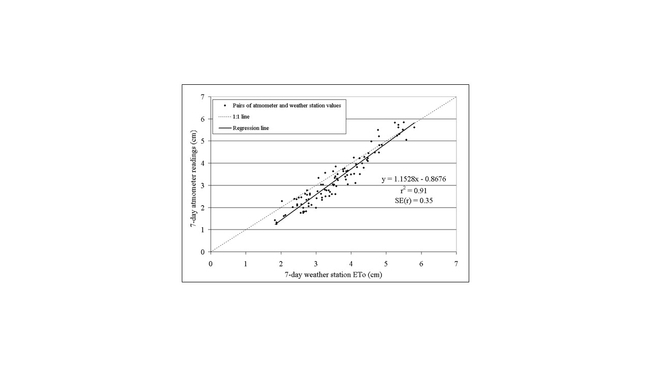 In this study, atmometers were placed adjacent to seven weather stations throughout the area, and weekly values for both methods were compared. 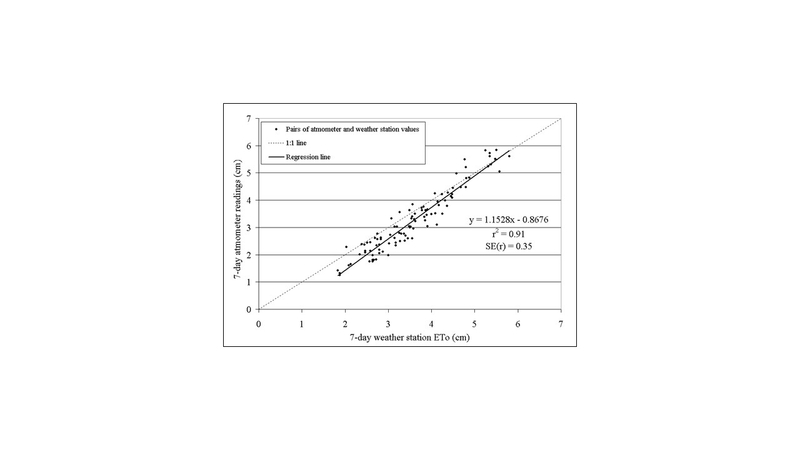 The results indicate that the atmometers and weather stations have very comparable ETo readings, with the atmometers indicating somewhat lower ETo values under conditions of lower evapotranspiration. Like any technique, using atmometers has advantages and disadvantages. Advantages include their very low cost and ease of operation, with no computer or power required. Disadvantages include the potential for damage by freezing weather, the need to refill the water supply (every three to six weeks), and the need to read the gauge manually. Also, if they are installed in a large open area, birds may tend to perch on the evaporating surface and foul it with their droppings; for this reason several wires are installed on top of the device to discourage birds from perching there. In general, atmometers function quite reliably with few problems. Converting atmometer ETo readings to the amount of irrigation run time required to replenish the soil moisture lost to evapotranspiration is fairly straightforward. A relatively simple example for a sprinkler-irrigated field is presented below in Table 1. 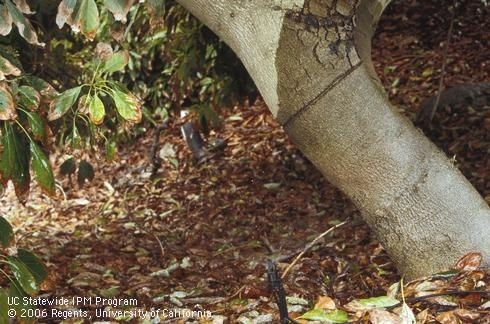 Recent talks by UC's new irrigation engineers can help shed light on irrigation improvements that also apply to plant health and better orchard management. The Pourreza talk has implications for identifying HLB infected citrus trees, as well as trees in general stress. The Spann presentation shows how avocado growers will be able to adjust fertilizer applications to their orchards. These talks are posted on the California Avocado Society website. "Old and New Smart Agriculture"
So, every few weeks the question comes up of whether to install soil moisture meters which leads to the question of which to buy and install or have installed. And then come the questions of what do the readings mean and why aren't the readings consistent. Or maybe this question arrives after the grower has installed the sensors or system and the values don't conform to a known or knowable pattern. The first question to the grower is why they want to install soil moisture sensors or a system. Everyone has a different answer which I've always found interesting. Usually it boils down to having more or better information, although it's hard to beat a good old soil auger. Which takes time and labor. So once that is cleared up, it comes down to what area they want to monitor. Is it an acre, 10 acres, 50 acres, 100 acres, 200 acres, 1,000 etc.? What are the different irrigation blocks, soil types, aspects? How complex is the area that is to be monitored? Do they need one monitoring site or many? Can the information be gathered in the field, or does it need to be accessed from a distance? Linked by hardwire, infrared, cell phone, wifi, satellite, etc.? Then the question is does the grower do the installation or is it done by a company? And then whatever the case is, who maintains the system and for that matter, who maintains the information? What software is used and who interprets it? And what sensors are being used: tension, electrical resistance, conductance, capacitance, electromagnetic…….? The list seems to go on and there are no models and brands coming out on a regular basis. And how reliable are the sensors? What's their lifespan? And what are they measuring and in what units? How affected are the readings by salinity and what soil volume are they measuring? And how important is their placement? This last point is so often overlooked. The sensor needs to be in the active root zone where water is being taken up. Not where it's convenient to read, not where the plants cant use the water. Placement is so often overlooked. And then how much do you want to spend? $100 per installation, $1000? With a monthly or yearly maintenance fee or none? Who responds when there are problems? Khaled Bali, our Irrigation Specialist at Kearney Research and Education Center near Fresno, is part of a group in the process of evaluating different types and models of soil moisture sensors. He should have a publication that can more accurately sort through the many sensor choices that are available at this time. But in time, there should be more models on the market and new update will be necessary. The question, though, is to ask yourself how irrigation is being done and how it can be improved. The basics of design, maintenance, distribution uniformity and how scheduling is being currently done – when and how much to apply. Definitely, soil moisture sensors can help, but you gotta know how to use them and maintain them, just like the whole irrigation system. A grower who uses tensiometers told me that people think of soil sensors as though they were reading a book. Something cut and dried. A simple plot line that you follow. Irrigation is not a book. There are many other subplots to irrigation than just reading the digital face. Looking at the weather, evapotranspiration, the tree, how fast the moisture is depleted, how deep the moisture is being pulled from all contribute to the "sensors" used to irrigate. Use them all. Even though this grower has irrigators on 250 acres of trees, he also checks the orchard tensiometers at least once a week on his own to confirm all of his senses. At a recent CA Avocado Society meeting there was a discussion about bout flowmeters and their selection. 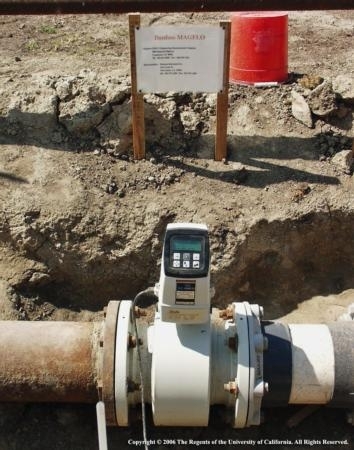 Flowmeters measure the volume of water moving through a full-flowing closed pipe and as such are one of the key components of an irrigation system whether drip, microsprinkler or full pressure systems. They are essential for managing irrigation efficiently and for monitoring the performance of the irrigation system. Managing irrigation efficiently requires: (1) knowing how much water the crop has used since the last irrigation (irrigation schedu7ling); and (2) operating the irrigation system to apply only the amount of water desired. A flowmeter gives the grower the information needed to apply only the amount of water required. A critically overlooked benefit of a flowmeter is that it makes it possible to identify changes in flowrate during the season (measured at the same pressure), which may indicate problems such as clogging of emitters or filters, leaks in the system or problems with the pump or well. There are several types of flowmeters and each has their pluses and minuses. Propeller meters are the most commonly used, but can pose two potential difficulties: debris in the water and a small loss of pressure which can be a problem with low flow systems. Alternatives are magnetic meters, ultrasonic, turbine and venture meters. Proper selection is based on pipe size, range of flow and pressure loss. But as with everything it depends on proper installation and maintenance. Attached is a nice little overview by Larry Schwankl on how to choose a flowmeter for your situation. but here's some written sources to get you started thinking.